We bring out the best in your tiles! The slate tile on this garden feature with planters and a pond where in bad need of some TLC. Seguro Nonslip Surfaces restored these tiles to there natural beauty making this focal point the subject of conversation for all the right reasons. This design element in the outdoor entertainment area of a corporate building is the transition point between two levels and sits on the edge of the patio. The combination of moisture from the pond and planters and exposure to the sun over a prolonged period of time took its toll on the slate leaving it dull and marked with rust and water stains. The client is in the process of renovating and updating the exterior of the building to reflect the quality and style of their brand and corporate image. Seguro Nonslip Surfaces first went to work on cleaning the tile and ridding it of rust and water stains. The tiles were left to dry and after a week were sealed to protect against exposure and staining. 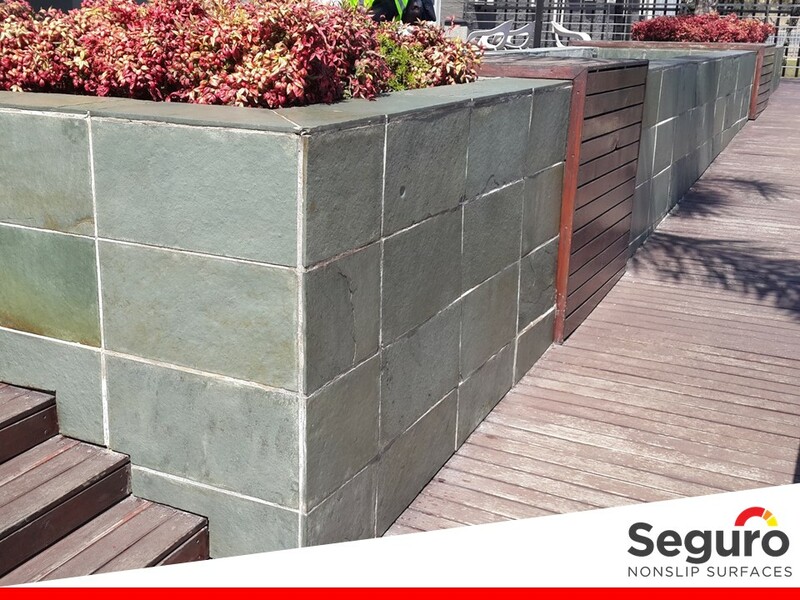 The sealer has brought out the stunning natural colour of the slate turning this feature in to a beautiful centre piece in the outdoor seating area. View the video below to see the transformation.